Home » 5 Reasons Why You Should Stay at a Costa Rica House Rental Instead of a Hotel! When planning a trip, the choices you must make can seem endless. One of the most important things you will decide is where to stay? We are here to help answer one of the most asked questions, should I stay at a Costa Rica house rental or should I stay at a hotel? The answer is clear: you should rent a house and here are 5 reasons why! We decided to put this at #1 on our list because it something that every traveler focuses on, no matter the budget it’s always good to save. Think of it this way: the money saved on accommodations means more tours, nicer dinners, and more imperial beers! Or, staying at your own 5-star mini-resort instead of a cookie-cutter 3-star hotel. Hotels in Costa Rica are overpriced, and staying at hotels becomes extremely expensive when traveling with a group. With vacation rentals, your money goes further! Save more while relaxing more. When you rent a vacation rental you get more than just a bed and a bathroom you get a home with a fully equipped kitchen. I know this doesn’t sound too exciting when planning your vacation yet it has some great benefits worth mentioning. Having a kitchen during your vacation allows you to save money on eating out for every meal. In touristy areas of Costa Rica, most meals start at $10 dollars per person and go up to $15 at nicer restaurants. By cooking some meals during your vacation at home you can save significantly. There is also the convenience of having the food come to you. There are a lot of Costa Rica Chefs and caterers that will come to the rentals to cook incredible meals in the convenience of your home. How relaxing does it sound to go straight from the pool to a local delicious 3-course meal? Lastly, by having your kitchen you are available to experience the local groceries and local farmers market. Experience the richness of Costa Rica flavors in the comfort of your PJs. Have you ever had a pitaya smoothie? It’s definitely worth a try and will likely become your favorite breakfast during your stay. Costa Rica is all about Pura Vida and having a great attitude, yet who wants to spend their afternoons in a crowded pool? One of the compliments we receive often is about the privacy and tranquility the guests feel when staying at our Costa Rica house rental. Most vacation rentals are off the main strip so there is more privacy, access to quieter beaches and altogether a more relaxing environment. A good way to describe it is that most vacation rentals are “close enough “yet “far enough” to really unwind. Rentals provide you with more space and more areas to relax. Most houses in Costa Rica are built with the sole purpose of being vacation rentals so their floor plan embodies that objective, showcasing a lot of open areas. Many clients have told to us how they rarely left the rental. From hanging out at the pool to watching the sunset on the beach to lounging in one of the many outdoor areas they said they never wanted to leave. Vacation rentals give you enough space to relax and a create lasting memories. Every vacation rental comes with a host and some houses even with a specialized concierge. Another great attribute of renting a vacation home is that you don’t only get a home, you also get a personal guide filled with local insight. The hosts’ main job is to make sure you are having an incredible stay, and they love to share: tips, secret beaches and their knowledge of the best things each town has to offer. Your host or concierge will become your go-to person during the trip and will turn into a friend by the end of it. The personalized care and attention they provide goes beyond what you will receive at any top hotel. CONVINCED YET? If the top 5 reasons above weren’t enough sure to check out our gallery and the photos should do the convincing! Leave a comment below and share with us your thoughts. 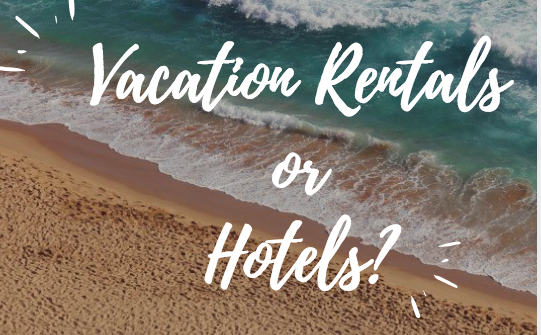 What differences have you experienced between house rentals and hotels?